I don't wear a watch. For years, I fondly thought this was a token, Luddite, pre-tech gesture against a life dominated by pixels and bytes. Now I've learned two-thirds of teenagers don't wear watches because they are so ‘last century'. Hardly a protest, then, but maybe I'm cool after all. By analogy, the bargain box in front of me looks both forward and back. Discs cheap enough one can buy them without thinking, therefore competitive with being able to download a single track. And is it also the last hurrah of the CD as a physical object, with its direct connection (box and discs in sleeves) not just with LP sets, but even back to the days of 78s (if one could even explain to a teenager what that is)? The presentation is pared down to single bright colours on the sleeves; the record company does not have to worry about length on each disc. I find small but significant advantages in the bargain box format – not just the saving in shelf space, but the ease of physically removing the discs means they actually get played, where many traditionally packaged multi-case sets sit even unwrapped. When the set itself (this one, of Masur conducts Tchaikovsky, is ten discs for little more than the price of two full-price CDs, and competes well with Brilliant Classics, let alone sweeping away Naxos for bang per buck) is such good value, it is no problem to have more, shorter discs, never to have to break symphonies across different CDs. That too is a throwback to questions long defunct – reviewers used to discuss whether an inappropriate side break on an LP was worth the money saved of not having an extra disc. In the days of 78s, artists were of course pressed to keep key passages to under three minutes. Or maybe these issues are still alive – Barenbom's recent Bach 48, on Warners, takes five discs with repeats, Ashkenazys' three discs without. When these Tchaikovsky symphonies first appeared in the late 80s and early 90s, Masur's central European structural smoothness came in for some criticism. One looks rather to the combination of fire and detail in Jansons, or, in the late symphonies, to the never-equalled Leningrad performances by Mravinsky. But it is absurd to think there is only room for one reading of Tchaikovsky. Masur is generally under-rated, and in particular his Mendelssohn (recorded, after all, with the Leipzig Gewandhaus orchestra so closely connected to the composer) is excellent. Tchaikovsky himself revered Mozart; these Masur discs are essentially civilised, Mozartean readings, not products of the tormented side of Tchaikovsky's life and mind, but Tchaikovsky as he would have wished to be in an idealised, transcendental world. In particular, Tchaikovsky is rightly praised for the clarity of his textures and orchestration. Contemporary Russians criticised him for being insufficiently nationalist; we should not make the same criticism of these recordings. For a moment when Masur's approach comes off especially well, listen to the end of Symphony 5, where he make the coda, which so often suggests a jerky gear change tacked onto the end of the finale, flow naturally out of the rest of the work. No coincidence that Masur's great central European predecessor Karl Boehm also had a fondness for the work. It is true that sometimes the ‘Polish' symphony seems to have turned into another Mendelssohn ‘Scottish' and migrated into an Edinburgh drawing room, while the ‘bonus' disc of famous waltzes would not be out of place at Viennese New Year. These are sculpted, not agonised performances; they remind us that Tchaikovsky looked with great reverence to the Central European symphonic tradition, and helped to shape its future. Elisabeth Leonskaya's playing is best described as a homage to her mentor, Sviatoslav Richter, and she has long been a favourite in her adopted city, Vienna . These are predictably powerful, storming performances of the concertos, including the completed torso of the third and the virtually unknown concert fantasy. The performance of the first concerto, moreover, the only well-known work on these two discs, holds it own among any competition, including the rightly celebrated Argerich – Dutoit. 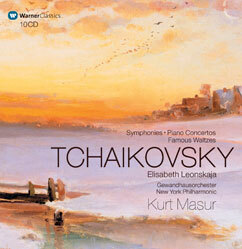 Between Leonskaya's punchiness and Masur's urbanity, the set as a whole is also well balanced.